On Saturday, January 10th, faithful from Christ the Savior Mission joined St. George Greek Orthodox Church in Ocean City, MD, for the annual blessing of the Atlantic Ocean. The services were led by His Eminence, Metropolitan Evangelos of the Greek Orthodox Church in America. Many thanks to Fr. Vasileos and the community of St. George for hosting this wonderful event to the glory of God! On Sunday, January 11th, Protopresbyter Daniel blessed the rectory in the Parish Center. Following the service for the annual blessing of a home, there was an open house in the rectory. Appreciation is expressed to Fr. Daniel as well as all who attended, prayed, prepared food, and shared in fellowship. 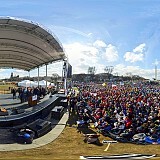 On Friday, January 22nd, members of Christ the Savior traveled to Washington DC for the annual March For Life. The march is a pro-life rally protesting abortion, held in the nation's capital near the anniversary of the decision in the United States Supreme Court case Roe v. Wade. 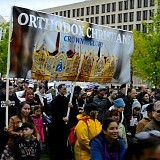 Among the numerous Orthodox Christians who took part in the March were His Beatitude, Metropolitan Tikhon; His Grace, Bishop Michael of New York and New Jersey; the OCA officers; faculty and students from Saint Tikhon’s Seminary, South Canaan, PA and Saint Vladimir’s Seminary, Yonkers, NY; and clergy and faithful of all ages from across the country, including a small contigent from Christ the Savior Mission in Berlin, MD. On Sunday, January 25th, the parishioners of Christ the Savior gathered together for their Annual Meeting. In addition to reviewing the minutes from last year's meeting, the parish body heard reports from the rector, senior warden, junior warden, treasurer, auditors, choir director and the parish council on stewardship. These Interviews with Fr. Daniel and Mat. Dunia Hubiak, conducted by Fr. John and Denise Jillions, took place on June 20, 2014. They were recorded by Steve Dixon utilizing the equipment and facilities of the Dorrance H. Hamilton Public Media Commons at WHYY, in Philadelphia, PA. They are part of the series, "Gift and Grace: Stories of Orthodox Clergy and their Wives," sponsored by the Diocese of New York and New Jersey (Orthodox Church in America). In documenting the lives of senior Orthodox clergy the series, edited by Fr. John Shimchick, explores the sense of gift and the mystery of grace that uphold both marriage and ministry. On Sunday, March 8th, with the blessing of our diocesan hierarch, Metropolitan Tikhon, the 2015 Parish Council members were installed into office. During the first meeting of the 2015 Council, George Kaloroumakis was elected Junior Warden and Kelly Hageman was elected Secretary. May the Lord bless them all! On Palm Sunday, April 5th, the faithful gathered to celebrate the Lord's Entrance into Jerusalem. The church was packed with record attendance for this highly festive day. During the Divine Liturgy, Michelle and Rylee Elizabeth Miller were received into the Orthodox Church through Holy Chrismation. Following the beautiful divine services, a traditional Bakaliaro fish meal was offered in honor of the Feast and the newly-illumined handmaidens of God. May they and all of us see the good things of Jerusalem all the days of our lives! Glory be to God for all things! 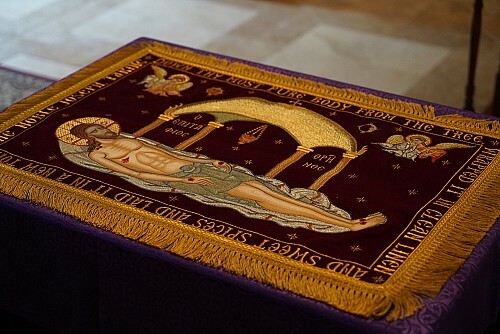 From April 5 - April 11, the faithful gathered at Christ the Savior to celebrated the solemn liturgical services of Great and Holy Week, which commemorates the Lord's voluntary Passion, His Cross, Death and Burial. 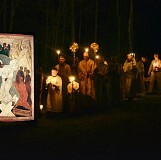 On Sunday, April 12th, the faithful gathered for the Midnight service, celebrating the Feast of Feast, Holy Pascha, which commemorates the Resurrection of our Lord God and Savior Jesus Christ. Some 120 people gathered for the celebration of the liturgical services which were followed by the blessing of foods and a festive meal in the hall and rectory. We greet you all with the joyous exclamation, "Christ is risen! Indeed He is risen!" On Sunday, May 31st, the faithful gathered to celebrate the feast of Pentecost which commemorates the descent of the Holy Spirit upon the Apostles fifty days after the Lord rose from the dead. As is customary, the Vespers for the Day of the Holy Spirit together with the Kneeling Prayers were served immediately following the Divine Liturgy. On Sunday, June 7th, the members of Christ the Savior Mission gathered for a special Parish Meeting to review the recommendations of the Parish Council regarding the completion of required repairs to the crawlspace beneath the Parish Center. On Sunday, June 21st, prayers were offered at the completion of the academic year, thanking the Lord for the blessing of His wisdom and knowledge, and asking Him to preserve the students in that which they have learned which is according to His divine law. On Sunday, July 12th, the faithful of Christ the Savior gathered for the Divine Liturgy followed by the Blessing of Automobiles. This annual blessing occurs near the feast of the Prophet Elias (who ascended as if into heaven in a fiery chariot). During the Divine Liturgy, Patricia McAlpin was received into the catechumenate, the process by which one is joined to the Orthodox Church. We congratulate her and her husband David, askings the Lord's continued blessings upon them! On Sunday, August 16th, the faithful gathered to celebrate the feast of the parish and the 15th anniversary of the founding of the Mission. Fr. John co-served with Protopresbyter Daniel Hubiak, the founding priest of the Mission, who offered congratulatory words and encouragement to the community to continue in Holy Orthodoxy for the salvation of the people of Delmarva. On Sunday, August 30th, prayers were offered for teachers and students on the occasion of the new academic year. May God grant His wisdom and understanding to them all! On Saturday, September 19th, a presentation on the subject of missions was offered by Archpriest Mark Koczak and Popadija Katherine Vitko from the Archdiocese of Washington's Mission Board. Sincere appreciation is extended to our presenters both for making the trip out to Christ the Savior as well as the informative and inspiring material they shared. On Sunday, October 11th, we had the Chrismation of Patricia McAlpin. We heartily congratulate her and her husband, David, on this joyous occasion. May the Lord grant the newly-illumined handmainden of God, Patricia, many blessed years! On Sunday, November 1st, prayers were offered at the end of the Divine Liturgy for those in the healing ministries. We ask the Lord's continued blessings upon all those who work with Him in the healing of mankind's physical, emotional, and spiritual wounds and illnesses. May the Lord grant them many blessed years of faithful service to Him and their fellow man! On Sunday, November 8th, the feast of the Archangel Michael and the Bodiless Powers, the children participated in our annual St. Michael's party, by dressing as saints and angels. A festive coffee hour was enjoyed by all as the children participated in the party's other activities, including a donut tree, bobbing for applies and a pinata. Many thanks to all who made this year's St. Michael's party such a great success! On Saturday, November 14, the Archdiocese of Washington gathered at St. Nicholas Cathedral in DC for the annual assembly. Christ the Savior Mission sent Fr. John Parsells (clergy delegate), Cheryl Kokkinos (lay delegate) and Barbara Kaloroumakis (observer), who was tasked with auditing the Archdiocesan financial records this coming year. Appreciation is extended to all who represented our mission as well as all those who led and attended this year's assembly. On Sunday, December 13th, three new sets of altar server vestments - red, blue, and green - were blessed. Two additional white vestments were also blessed, making 10 vestments of various sizes in each color for our altar servers. The remaining two liturgical colors - gold and purple - are hoped to be ready by February, 2016. We thank the donors, the tailors from the Republic of Georgia, as well as those who place the order and assisted with transit. May the Lord bless one and all! As the faithful gathered to celebrate the Nativity of the Lord, God and Savior Jesus Christ according to the flesh, we were pleased to congratulate Chad Fortin who was enrolled into the catechumenate during the Christmas Liturgy! We humbly ask the Lord's continued blessing upon him and you all for a joyous, peaceful and grace-filled festive season and New Year. Christ is born! Glorify Him! On Sunday, December 27th, children from the mission put on a small Christmas Pageant following the Divine Liturgy. The performance was enjoyed by all, and appreciation is expressed the organizers as well as parents. During the coffee hour, after the pageant, the community congratulated Protopresbyter Daniel Hubiak on his upcoming 89th birthday, wishing him "Many Blessed Years!"